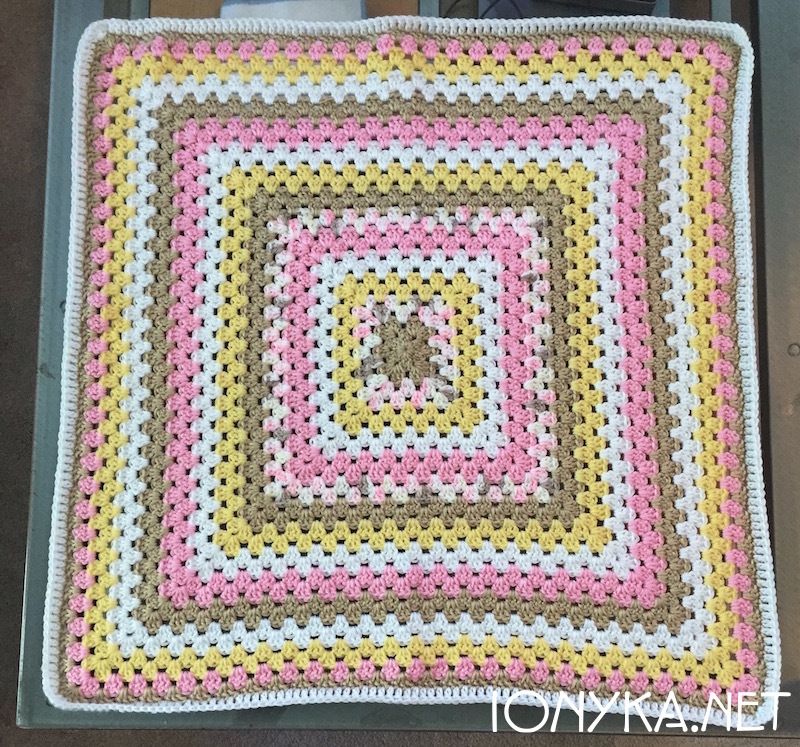 First up is a pattern I found awhile back that I wanted to use with our nursery colors. 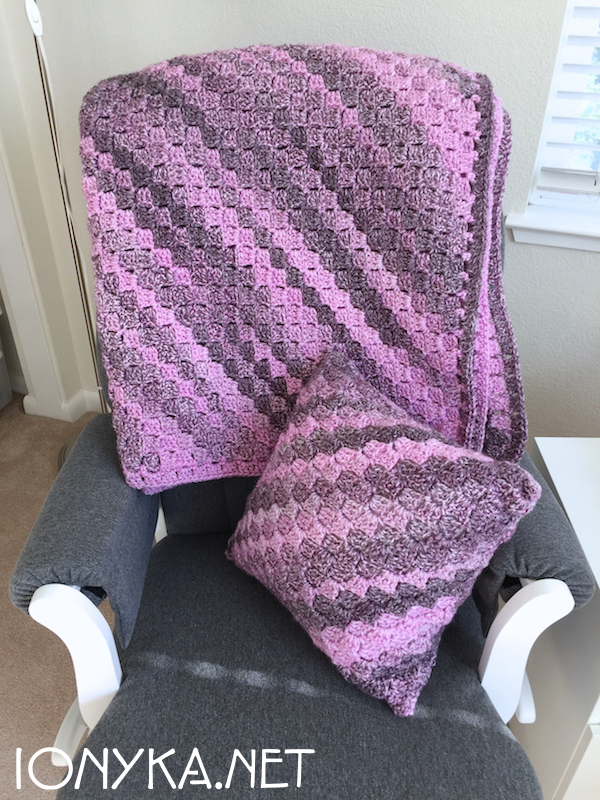 I liked the mix and match look of the squares and knew it would be something I could do relatively quickly as the patterns are fairly basic. 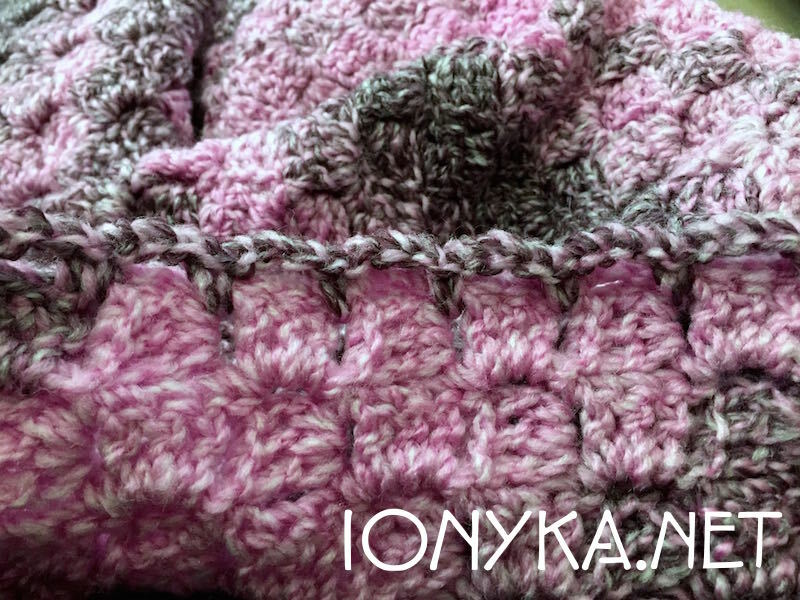 Materials Used: Size 5.0 Hook, 2 skeins each of Red Heard Super Soft Yarn in White, Light Pink, Heather Gray & Dark Gray. I ended up not using the full 2 skeins of each color and depending on how you choose to divide out the colors for the squares it can vary but I ended up using around 1.5 of each. 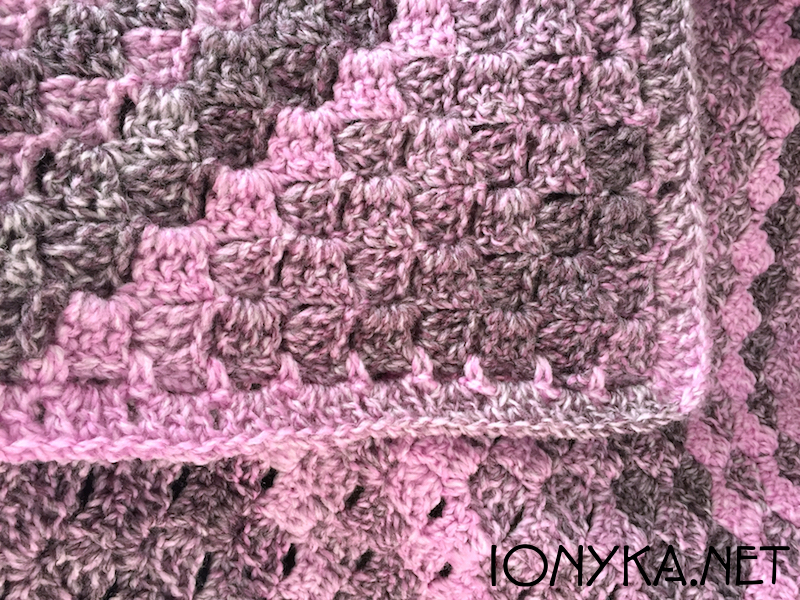 For the border I kept it simple with just a row of the pink sc all around, then a standard granny square row of each color. 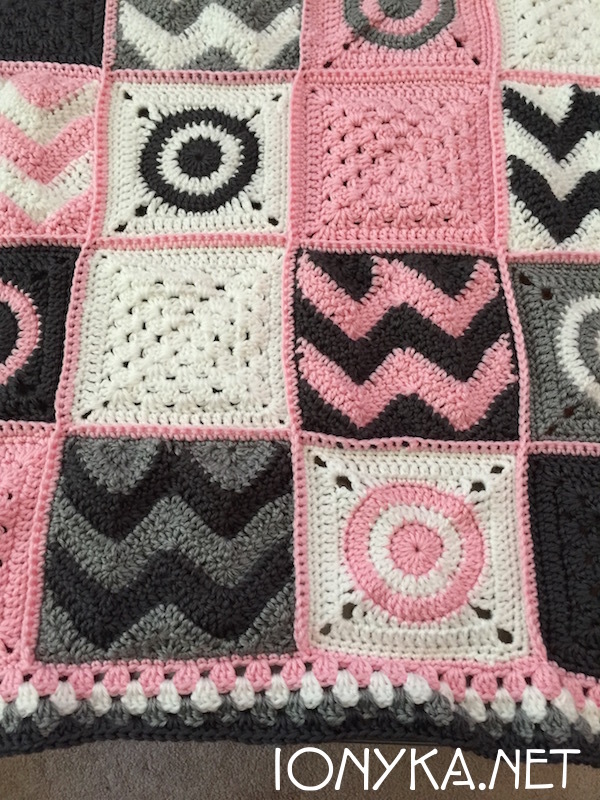 It was then that I noticed that the chevron squares came out a little larger in size than the circles squares, so it created a bit of a ‘bumpy’ effect, but it isn’t too noticeable (except for me!). 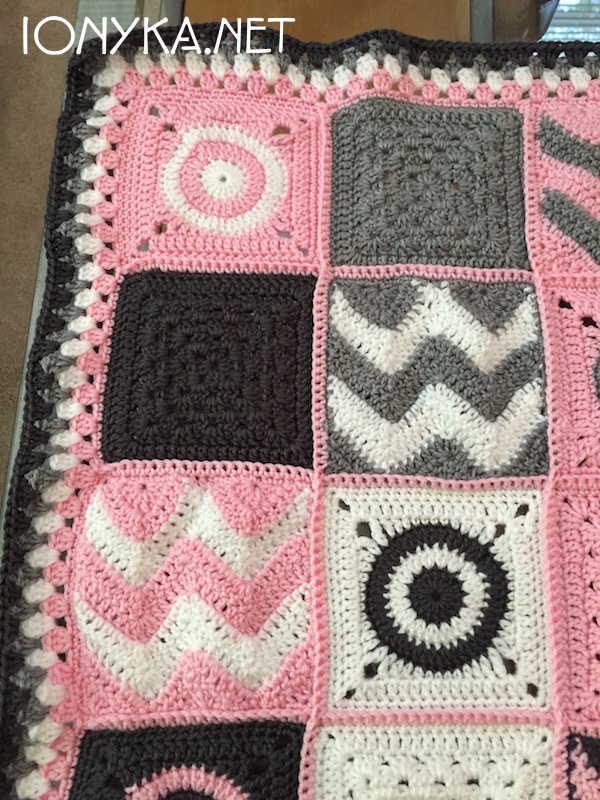 If I were to make another one of these, which is highly likely as they would make great gifts, I would instead add another row of dc to the circles squares in addition to the pattern, to size it up a bit. Otherwise the pattern is very nicely written and was easy to get the hang of. It goes really well with my glider too! 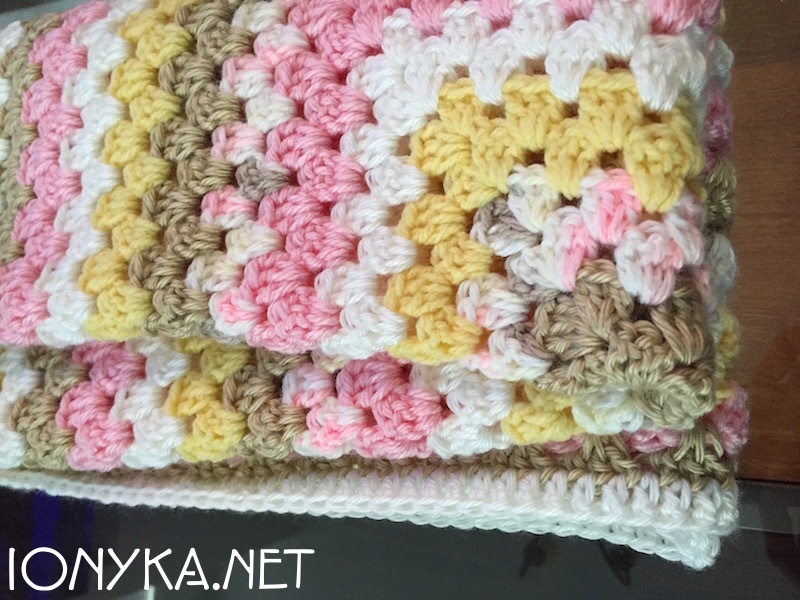 Next up is a blanket that while intended to be a “baby” blanket, I went a little (read: a lot) overboard with the size and made a rather large blanket instead, but I really love this yarn so let me explain. 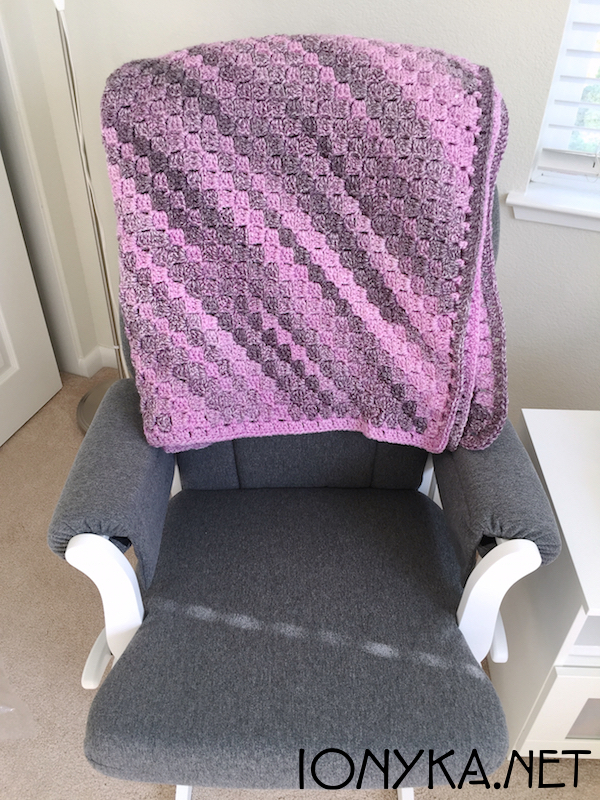 While I was working on my Chevron Blanket I had finally decided on the colors for the nursery so I went searching for some fun chunky yarn to try out the C2C (Corner to Corner) pattern with. 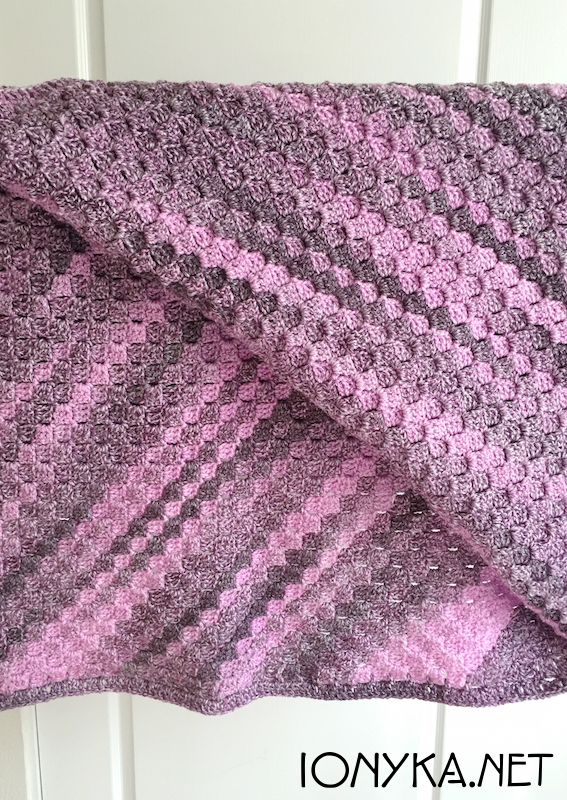 I immediately turned to a long time favorite brand James C. Brett and was excited to find a yarn that had both the light pink and the grey I wanted. Score! 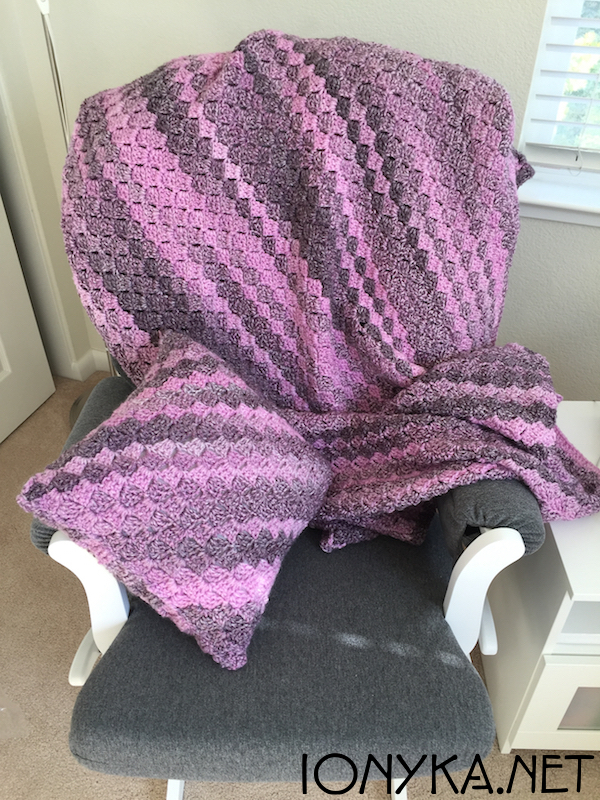 I did not really follow any pattern for this blanket, but I did reference a youtube video to get me started and learn how to begin to decrease once I got to the width I wanted. 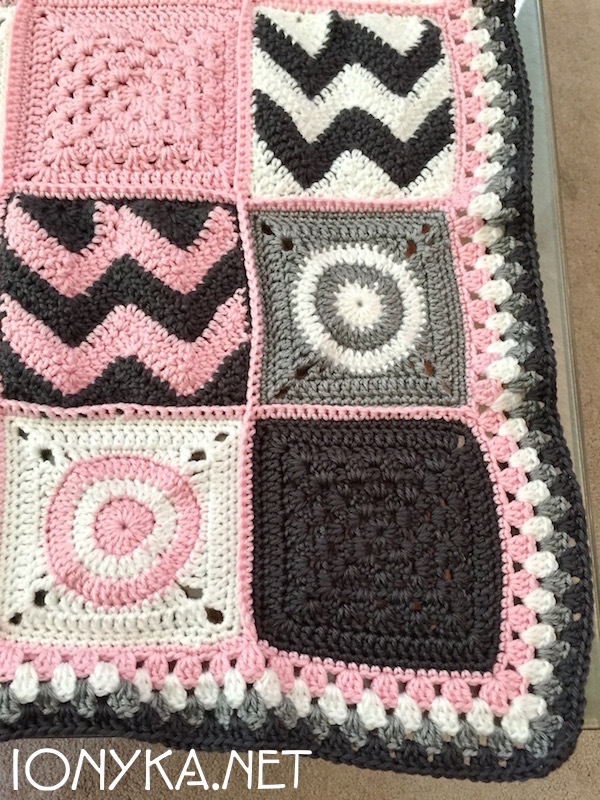 It is very easy and works up soooo much faster than the Chevron, which I think is one of the reasons it turned out larger than a standard baby blanket size. Materials Used: Size 6.0 Hook, 7 x skeins of James C. Brett Marble Chunky Yarn in MC20. I originally purchased 6 skeins, but when I finally was working my way down to the corner, I was a handful of rows short, doh! So in order to finish it and also do a border, I ordered 3 more skeins, but only ended up using 1 of them. Which worked out nicely actually because I remembered I had a 16×16 pillow form from a Joann’s run awhile back so I made a matching pillow to go with it! Then I went around again and put 3dc in each ch3, and put [2dc, ch1, 2dc] in each corner. I think it gave it a nice finished look but not a think border, which I am happy with. 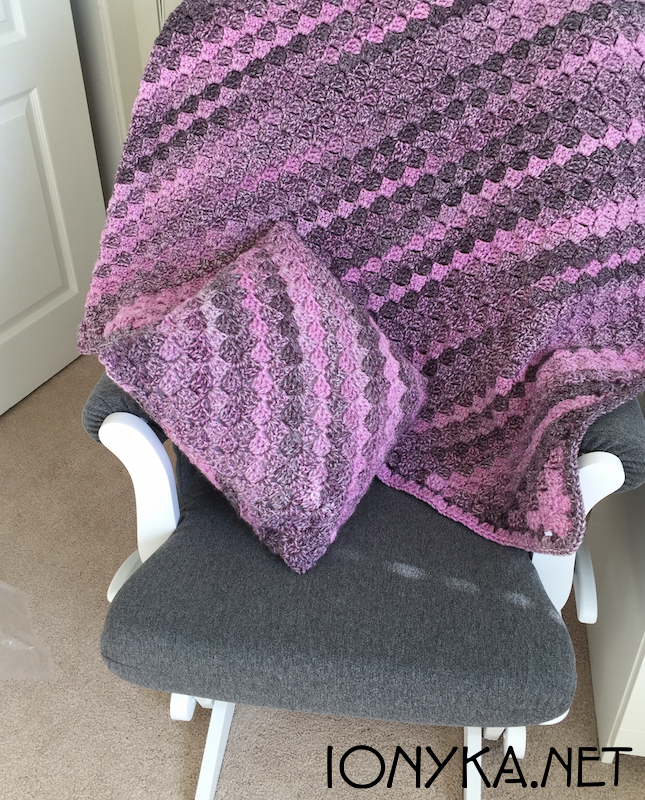 The final size ended up being around 55 x 80, which means it is big enough to be a couch blanket for me to use while I am nursing or sleeping etc. 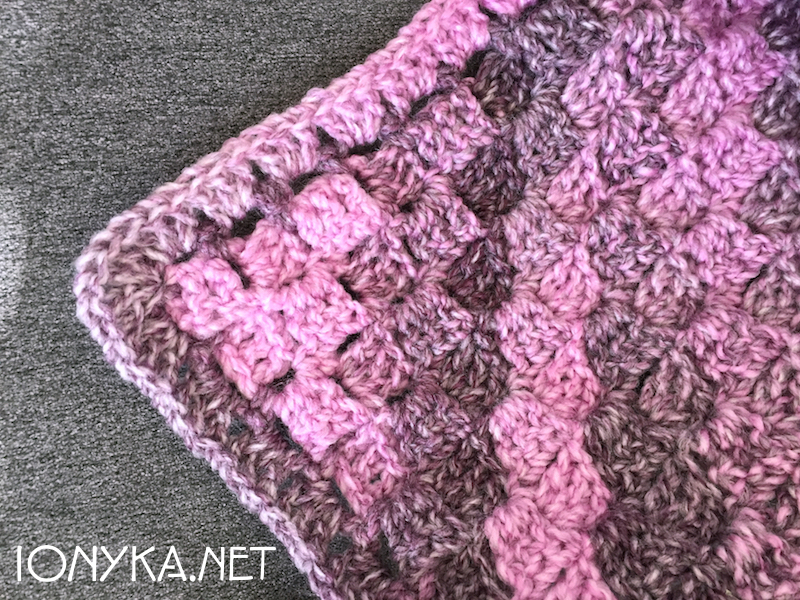 The pillow I made in the same C2C fashion, making 2 C2C squares of 16 rows each, then joining them together with a simple whip stitch. Even after all of that I still have 1 full skein left over of this yarn, so I will see what I end up doing with it, but I foresee an actual baby size blanket in the future for it likely! Fortunately I have a good friend who is also pregnant and lives just right around the corner from us so we have gotten to share this experience together which has been so fun. 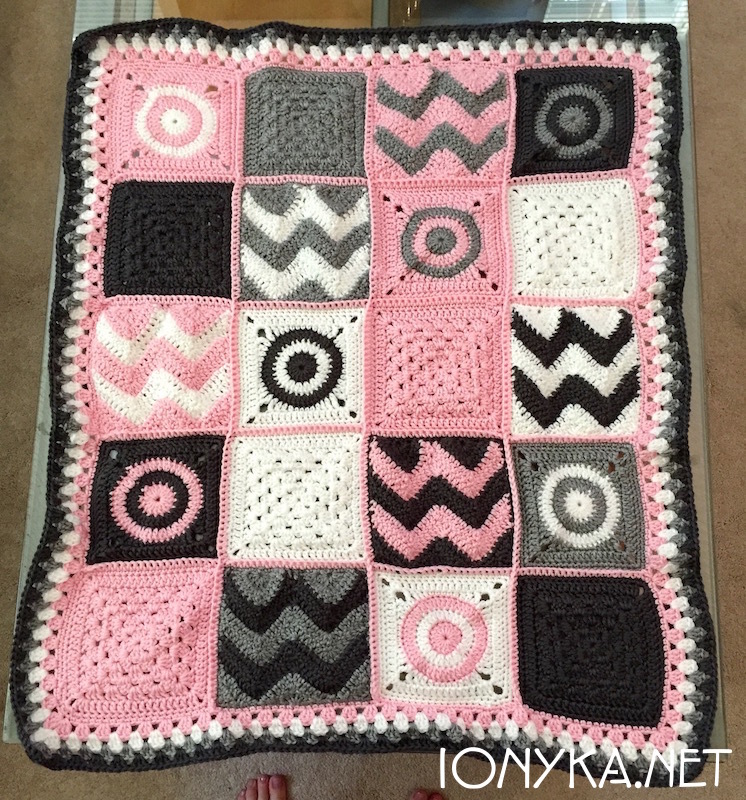 I wanted to make her a baby blanket in her nursery colors too so I gathered up some yarn and made her this granny square blanket with a solid white border. Materials Used: Size 5.0 Hook, Red Heart Super Soft Pink & White, Caron Simply Soft Light Yellow and Tan and a little bit of what I had left of some Bernat Softee Baby yarn called Little Bo Peep that included all the colors together in an ombre, which I had used previously to make some little baby hats for friends and myself. No pattern followed, just kept going with 2 rows of each color in a somewhat randomized way. Ended with a straight row of white dc’s all the way around. 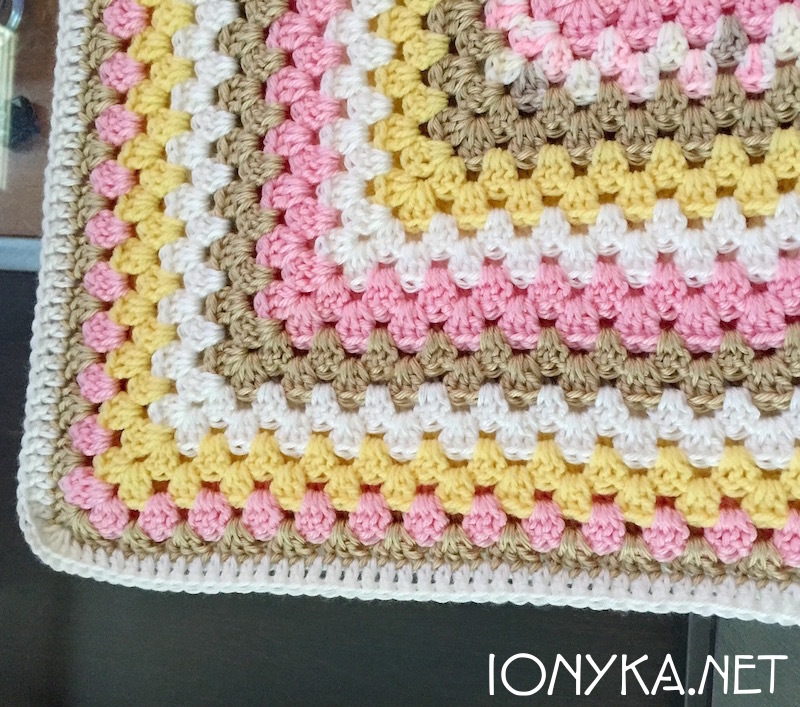 It turned out to be around 30 x 32 inches which is what I was going for luckily as I ran out of the ombre yarn very quickly and also the pink. 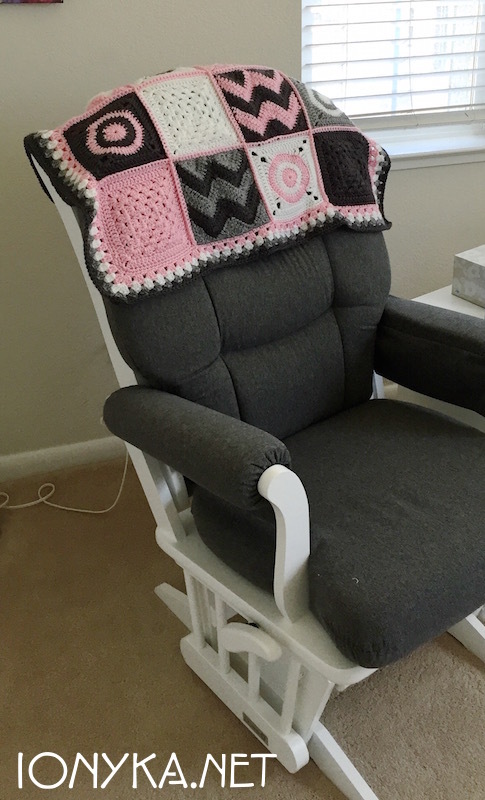 I gifted this blanket and a matching little hat like the one I made above to her this past weekend at her shower and she was so thankful to receive them! Big Thank You to Michelle’s Zoo a fellow SF Etsy member for making our first personalized blanket and plushies for her! See everyone on the flip side :) Thanks for stopping by! 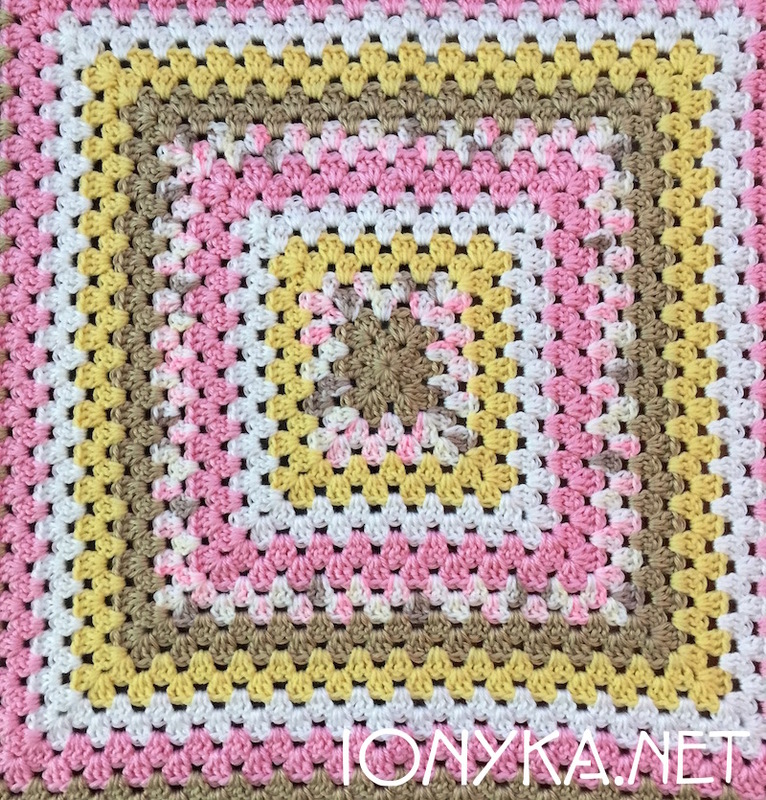 This entry was posted in General News, New Project, Patterns, Project Update and tagged baby blanket, bernat softee baby, blanket, c2c, chevron blanket, corner to corner, granny square, james c brett, little bo peep, marble chunky, nursery colors, nursery room by ionyka. Bookmark the permalink.